What is density of lumber? In a general sense, density is defined as mass per unit of volume. For lumber, that could be given in units of pounds per cubic foot, or expressed as specific gravity (or relative density) where the density of the lumber is divided by the density of water (also in pounds per cubic foot) and expressed as a percentage: i.e. 0.55 for Southern Pine. That means one cubic foot of Southern Pine lumber has a mass 55% of the mass of one cubic foot of water. Items with a specific gravity less than 1.0 would float in water and items with a specific gravity greater than 1.0 would sink if placed in water. For lumber, the actual specific gravity varies depending on the moisture content, because both the mass and the volume vary with moisture content. For this reason, the specific gravity of lumber is usually given under standardized conditions. That is, the actual value is based on the mass and volume of lumber converted to a 0% moisture content. There is an ASTM Standard: ASTM D2395 Standard Test Methods for Density and Specific Gravity (Relative Density) of Wood and Wood-Based Materials, which gives procedures for determining the specific gravity of various lumber products. Why is the density of lumber important? The density of lumber, like the moisture content discussed in a previous article, will affect the weight of the lumber. This will affect the cost to ship the lumber as well as the overall weight of structures built with lumber. The density of the lumber is also an important design consideration. Most specifically, connections in wood design are dependent on the specific gravity of the lumber being connected. The National Design Specification publishes an average specific gravity value for species of wood used in structural design. Individual pieces of lumber will vary in specific gravity. The value published in the NDS is an average value for an entire species or species group. Many of the strength properties of lumber are correlated with the specific gravity of the lumber. That is, species with greater specific gravity values are generally stronger than species with lower specific gravity values. Southern Pine lumber may be graded as “dense”. What permits lumber to be classified as “dense” from a grade rules perspective? According to SPIB Grading Rules, dense lumber must meet a minimum number of annual growth rings per inch, as well as a minimum portion of each growth ring must be made up of the “latewood” or “summerwood”, the darker part of the growth ring. 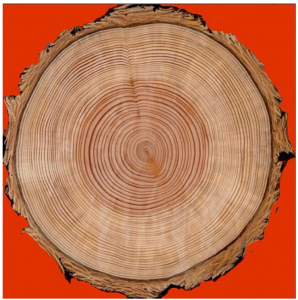 The figure below is a cross section of a tree showing the annual growth rings. The darker portion of each ring is the Summerwood and the light portion is the Springwood. A piece may be classified as dense if it has at least 6 annual growth rings per inch, measured along a representative radial line, and the growth rings average one-third summerwood. Alternatively, a piece may be classified as dense if it contains at least 4 rings per inch and 50% summerwood. If lumber is graded out as dense then the residual lumber of the same grade which did not make the dense must be grade-marked as “nondense” (i.e. No.2N) or placed in a lower grade.